This small family owned travel boutique was introduced to Boulder in 1993, and has thrived for the past 25 years by World Traveler Cindy McClelland. We would like to say a HUGE THANK YOU to all of our loyal customers for shopping local and sharing the passion of travel with us! Pack light for your next trip by learning the latest in travel tips for easy packing! Learn the secrets, dos, and don’ts from very experienced travelers. Traveling light can be a daunting task for some and many worry about over packing. Worry no more and join us this evening to absorb the tricks of the trade. And Hey, who doesn’t like saving money by not checking a bag? The Dolomites area of northern Italy is a beautiful and historic region presenting hikers, climbers, and bicyclists, and skiers many exciting opportunities. Learn about some of the best hikes in this fascinating UNESCO World Heritage site, including Rosengarten, Civetta, Sassolungo, Pralongià, Gardenaccia, Schlern, Odle/Geissler, and more. After a day in Bozen/Bolzano, where we meet Ötzi, “the iceman,” it’s into the mountains every day for sunshine (most of the time), wildflowers, refugios, and views, and back down into four valleys, where the ancient language of Ladin predominates for food and refreshing evenings. Four cities sat at junctures of the old Silk Road connecting Europe and Asia and they prospered because of it. Each was a regional capital and one was capital of an empire. In addition to being prosperous and powerful, they were also centers of learning and culture. These four cities (Tashkent, Samarkand, Bukhara, and Khiva) with their stunning architecture and World Heritage Sites are the subject of Richard Lion’s talk based on his visit last Spring. Although all four are in Uzbekistan today it has only been around for 1/2 percent of their existence and largely irrelevant to their history. To our young ADVENTURERS, we are fully stocked with Heys suitcases for the kiddos that match every personality. These ADORABLE rolling suitcases come with a personal backpack to match. ….maybe even a great way to collect those delicious eggs the Easter Bunny left behind. Just in time for spring and summer travel, one of our bestselling brand’s Xero Collection is back in stock. In three different colors and sizes, you’re sure to find one that fancy’s your travel style. 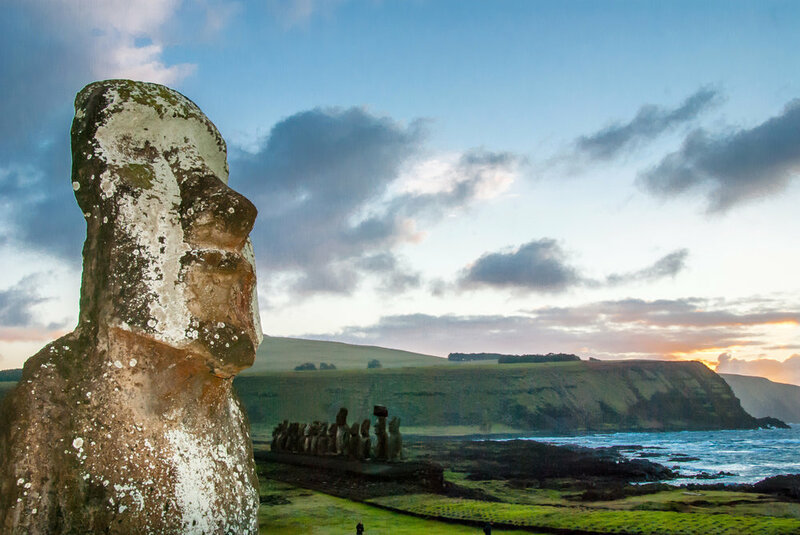 HINT: Can you name this South Pacific island, whose iconic statues are threatened by climate change? Last Month’s Answer & Winner: We are so excited about all the answers that were sent back to us this past month, due to our full inbox of the correct answers, we have randomly selected the winner of last month’s “Where in the World” to be – Terri Albright!- who correctly answered The Bean in Downtown Chicago J Congrats to all who also answered correctly! Thank you for all the participants who sent in their best guesses to this “Where in the World” posting. Give this month another go and win a $10.00 Changes in Latitude Certificate! The following tips are from Lonely Planet’s “Best Travel Tips”. This book is available in our store and is filled covered to cover with travel tips that will only aid your experience and adventure. Traveling to a new destination allows you to not only get a taste scenery, but also the amazing local foods. The big question however is when and where. 1. Time of the day: Like any business, markets open early to get the day rolling. So you may choose to skip your regular breakfast plans and head straight to the market, plus this is when the food is the most fresh. 2. The Source: Using common sense, eat the foods that are local to the destination, if a location is known for a certain type of food, you should not have to worry about its source, if it’s a stretch from where it may have been picked or plucked, hesitation may be in your best interest. 3. Shop Around: Just like shopping at home, you know where to shop for certain foods. Don’t buy everything in one place and don’t choose the first place that you happen upon, ask around and explore. 4. Trust your nose and not your eyes: Markets are focused on selling their best products, such as produce. Though some stand may look more aesthetically pleasing, doesn’t necessarily mean that they are the best quality. 5. Get in line: If you notice a food stand or vendor with a long line, it’s probably for a good reason, trust the crowds. Lastly, TRY EVERYTHING, don’t be shy to new foods! For anyone traveling to BRAZIL, according to the New York Times, there has been a major outbreak of Yellow Fever in Brazil. If you or someone you know is traveling to Brazil in the near future, we advise you to educate yourself by searching CDC Yellow Fever Brazil to stay up to date with the this current situation. One of our committed Customers Lynette B, as she basks in the Florida sunshine sporting our CIL baseball cap.